Russia's papers have been anxiously following the operation to rescue the submersible stranded on the seabed off Kamchatka. Most draw parallels with the Kursk disaster five years ago, and are critical of the Russian navy's efforts to save the crew. The way the rescue work has been organised is very reminiscent of the situation with the Kursk submarine. Just like five years ago, naval command failed to reveal that the accident had happened, and then said for some time that the submariners had enough oxygen and food and that stable and permanent contact with them was being maintained. At the same time, just as with the Kursk, the real operation to rescue the submersible began more than a day after the accident. In both cases, the navy simply proved ill-prepared to carry out the operation, because of faulty equipment and a lack of specialists. August is a black month for our submarine fleet. The Kursk nuclear-powered submarine sank on 12 August 2000 during exercises, and a K-159 class submarine sank on the night of 29-30 August 2003 as it was being taken for scrapping. And now there's another emergency. This time disaster has befallen a rescue sub with seven on board. And just like five years ago, the country anxiously waits for news - will they be rescued? Or will it turn out the way it always does? After all, the clock is ticking, and the best-case scenario is that help will only arrive in a couple of days. 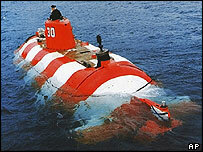 The attempts by the crew of the submersible... to free themselves of their own accord failed to bring any result. It was clear that a large-scale rescue operation was unavoidable. And the main problem now is whether the Pacific Fleet still has the forces and capability to carry out this sort of operation, or whether a tragedy, in some respects similar to that which occurred in 2000 with the Kursk nuclear-powered submarine, is inevitable. The course of events thus far, alas, provides all too many grounds for pessimism. It seems as if the longer the rescue operation goes on, the more oxygen there is on the submarine. But if they've already been told, then what's the point of covering things up?... We've got a question for the defence ministry: what state secret would we be revealing if the public is told the surnames of the AS-28 sub's crew?